TVNZ 2’s comedy block rebounded on Wednesday from the previous week’s lows, partly because of aggressive promotion. If you watched The Big Bang Theory at 8.00, you’d have noticed a sharply-cut promo for Will & Grace straight after the opening credits. 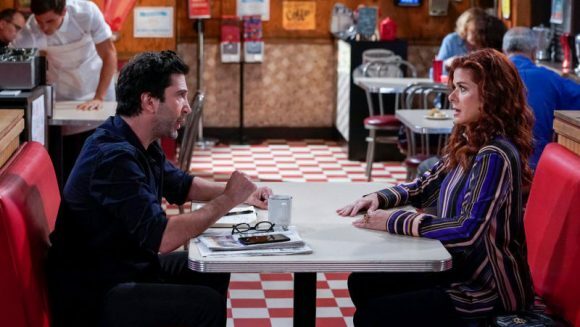 It emphasised the episode’s guest appearance by Friends star David Schwimmer as Grace’s love interest and helped the show to win its 8.30 slot in all the core commercial demographics. The half-hour averaged 3.7% of TVNZ 2’s 18-49 audience, 4.4% of 25-54 year-olds, 3.8% of 18-39s and 6.3% of household shoppers with kids. The spillover helped lead-out Kevin Can Wait to win its slot in three of the core demos while proving competitive with 25-54s. The big loser was TVNZ 1’s 800 Words, which lost to not only the comedies in all the key demos but also Three’s Gogglebox. The Aussie comedy/drama did improve on its lead-in, Britain’s Best Home Cook, which went completely off the boil with averages of merely 0.6% -1.8%. It was crushed by Three’s Grand Designs NZ, which averaged 5.9% of 25-54s and 4.1% of 18-49s to win the 7.30 hour, although it lost to Young Sheldon in the other core demos and to TBBT among 18-39s. Three’s Hawaii Five-O won the 9.30 hour in all the key demos. It averaged 2.9% of Three’s 25-54 audience vs 1.6% for 1’s Coronation Street and 1.5% for 2’s Talkin’ ‘Bout Your Generation. However, H50 was challenged by the second hour of Prime’s timely Prime Rocks repeat, Freddie Mercury – The Great Pretender, which averaged 2.7% of 25-54s and 2.0% of 18-49s. Earlier, 1’s Seven Sharp and Three’s The Project seesawed dramatically, with the latter winning the 25-54 and HHS ratings, and the latter 18-49 and 18-39. Three narrowly won the night with 25-54s but 2 dominated in the other core demos.